Nipper Plants, also known as Walking Piranhas (also misspelled as Walking Piranas), White Piranhas and Baby Piranha Plants, are small Piranha Plants. They have white heads and short green stems with two leaves on either side. In the Yoshi's Island games, they are produced from Nipper Spores, which clashes with the suggested oviparity of Piranha Plants. They first appear in Super Mario Bros. 3, where they would patrol an area and jump up towards the player when they pass over them. Walking Piranhas can hop around, making it more difficult for the player to land safely, since the plants will harm the player if they attempt to stomp on one. Instead, Walking Piranhas can be defeated by Invincibility, Fire Mario and Fire Luigi's fireballs, Hammer Mario and Hammer Luigi's hammers, Raccoon Mario and Racoon Luigi's tail attack and Tanooki Mario and Tanooki Luigi's transformation. In subsequent remakes, they were re-colored pink rather than the usual white. In all versions, a jumping Walking Piranha is a recolor of two Muncher frames. A sessile, fire-breathing variety is encountered at the end of World 7-8, called Fiery Walking Piranha. There is only one in the entirety of the game. Nipper Plants make a few appearances in The Adventures of Super Mario Bros. 3. In these appearances, they behave much like their game counterparts in that they are capable of hopping around. On the show, Nipper Plants sport visible jaws that make them appear to be more menacing than their in-game counterparts. Their teeth are yellow and human-like, but number far more than a human's. 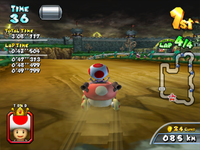 In "Reign Storm", Mario intends to send via Warp Pipe a letter to Princess Toadstool, in which he prompts her to return to the Mushroom Kingdom. However, a Nipper Plant that was taking shelter inside the Warp Pipe intercepts and eats Mario's letter. 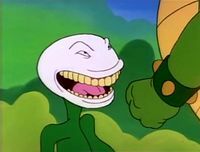 The Nipper Plant then travels to King Koopa to inform him about the letter's content. In "A Toadally Magical Adventure", Cheatsy Koopa uses a Magic Wand to increase a Nipper Plant's size and sends it to attack Mario. However, the plant lunges at the Pipe Creature that was having Mario in its grip, accidentally releasing Mario. Of note is that Cheatsy only refers to the Nipper Plant as "Piranha Plant". Artwork of Nipper Plants appear in Super Mario Bros. Print World, but they are incorrectly labeled as Munchers, the similar, but black-colored enemy from Super Mario Bros. 3 (which the poses of the artwork are borrowed from). There is additional artwork of Mario jumping over a Nipper Plant, labeled as "Mario 1". Wendy O. Koopa is revealed to have a pet Nipper Plant, which she keeps in a pot in her room, in Koopa Capers; the plant had shredded a note possibly pertaining to her whereabouts. If Luigi chooses to begin his search for the missing Koopaling by looking through her room, he accidentally wakes up the sleeping Nipper Plant when he tries to look under it. Some wild Nipper Plants later appear prowling the stairs leading up to the secret camp being used by Wendy and her rebellion. In Super Mario World 2: Yoshi's Island and its remake Yoshi's Island: Super Mario Advance 3, Nipper Plants do not jump at the player and are much easier to defeat, but they appear in groups which adds to the challenge of defeating them. They hatch from Nipper Spores that slowly fall to earth and have no visible eyes. These Nipper Plants can be stomped or eaten and turned into eggs; their spores can also be swallowed, though no eggs will be produced as a result. Nipper Plants and their spores reappear in Yoshi's Story, Yoshi's Island DS and Yoshi's New Island. Nipper Plants reappear in Yoshi's Woolly World and Poochy & Yoshi's Woolly World, acting the same as in previous games. In Super Mario RPG: Legend of the Seven Stars, Nipper Plants (under the name Chompweed) appear in the Pipe Vault, and cannot be battled. Rather than fighting the player, they jump up and steal a few coins if they get too close. Stolen coins can not be recovered in the final game, but battle data for them still exists, suggesting that they may have been intended to be standard enemies at one point. Nipper Plants reappear in Super Princess Peach, where they are identical to the ones that appeared in Super Mario World 2: Yoshi's Island. A Gloom vibe-infused variety known as Sad Nipper Plants also appeared in this game. Some Nipper Plants made a cameo appearance in Mario Kart Arcade GP in the course Bananan Ruins. They are at the right side of the course. They also appear in the course Castle Wall. In Mario Tennis Aces, two Nipper Plants can be seen bouncing in the background of Petey Piranha's battle in the Forest Monster mission. A Nipper Plant appears as a grab-type, primary spirit in Super Smash Bros. Ultimate. It can be enhanced to a Petey Piranha spirit at level 99. On the Palutena's Temple stage, Nipper Plants are mentioned briefly by Viridi during Palutena's Guidance dialogue for Piranha Plant. In the Super Mario Mash-Up Pack in Minecraft, Peonies are replaced by a group of Nipper Plants. A 2017 interview reveals that Nipper Plants were going to appear in Super Mario World, as shown in a prototype sprite sheet. ↑ Nintendo Power Volume 13, page 58. ↑ Super Mario Bros. 3 English instruction booklet, page 40. ↑ Nintendo Power Volume 13, pages 57-58. ↑ Game & Watch Gallery 3 English instruction booklet, page 20. 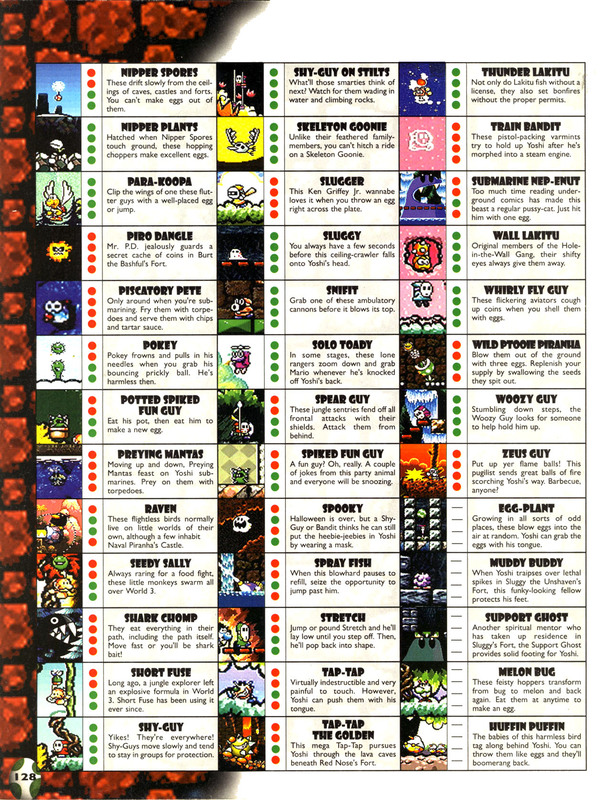 ↑ Super Mario RPG: Legend of the Seven Stars Nintendo Player's Guide, page 39. ↑ Super Mario Bros. 3 Japanese instruction booklet, page 41. ↑ Wawro, A. (September 28, 2017). Have a look at Nintendo's early prototype for Yoshi. Gamasutra. Retrieved December 8, 2017. This page was last edited on April 12, 2019, at 08:55.